Happy Monday! Hope you are having a nice Monday so far, and hopefully you all had a safe weekend. I know a lot of people were getting snow and flooding, so I hope you all are doing ok! 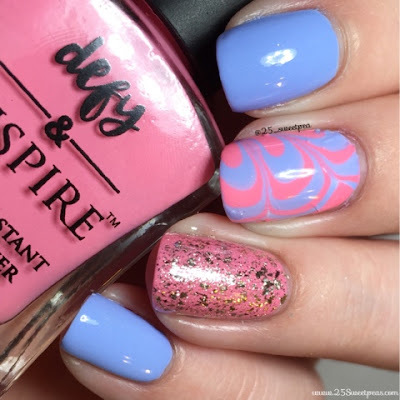 :) Last night I got this crazy idea to try to Watermarble with the new Defy & Inspire polishes by Target. 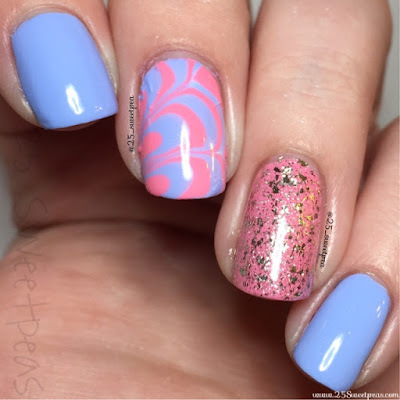 So I did it in the style of a Watermarble decal, anyone want to see?! 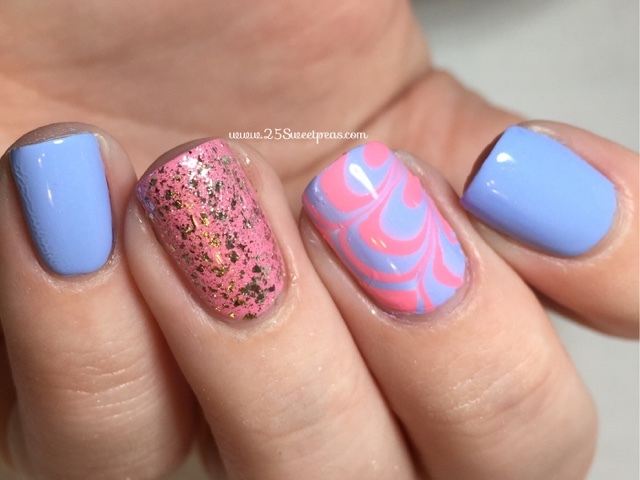 To do a "Watermarble decal" you do your regular Watermarble steps. Your out the polish in the water and then pull the colors how ever you want. Then instead of dipping your nail down into the water just walk away and leave it. 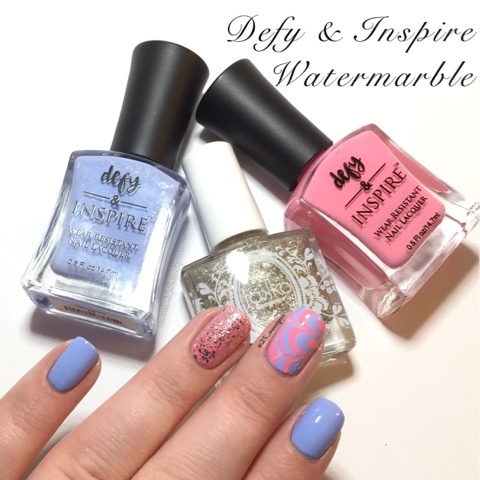 I did the Watermarble part and then went and took of my polish, filed my nails and put on base. Then I added white on the nail I was going to apply the decal on and then went and carefully removed the water marble. I used a orange stick to help move it out. Once it was out I then put th part I wanted on the white while it was still tacky. The extra parts I just removed by pulling down to tear it and or I would use the point part of the orange stick to remove excess water marble decal. Then cleaned up and added top coat! It's a bit of a daunting type of thing to do, but I do find it easier than dipping your nail down in water. I want to keep trying this because each time I do it it gets better. I used Bachelorette and Laguna Beach from Targets Defy & Inspire line. I was really impressed with how they spread in the water and they seem to work well for water marbling. So that is exciting! They spread a lot better than other polishes I have tried to use so if I get more colors this may happen again! The sparkly nail has a few coats of Takko Lacquer Salient on it which comes out tonight at 8PM EST. If you want to see all of the polishes that Takko will have out tonight check that out here. Well that's if for this blog post on this fine Monday! Hope you all enjoyed this! If you have any requests I would be happy do some so just let me know, and let me know what you thought of these below!